Jane needs a project management tool for her team. First, she reviews a few articles on well-known blogs about the benefits of certain types of project management tools. She browses around some PM app websites. A little later, she sees a targeted Facebook ad from one of them and clicks through to a lead magnet – a drip campaign showing her how her team can use project management to shorten their workdays and ship more. She reads every email. Sometime during the drip campaign, she decides to try out the freemium product for a while. After she’s created a few mock projects, someone from the company contacts her through email and asks if she has any questions. OK, so that’s sort of the fantasy of how it’s all supposed to work, but here’s the question we’re trying to answer: How did the marketing team know at every stage when Jane was ready for the next step? Answer: Through an effective lead scoring model. 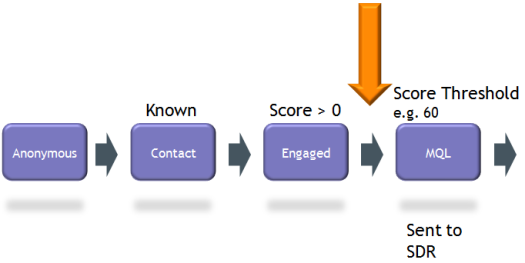 What is Lead Scoring or Lead Qualification? According to the Spear Marketing “State of Marketing Automation Maturity” report, 68% of marketers use a form of lead scoring or lead qualification to move prospects from one stage of the funnel to the next. At its basic level, lead scoring awards points to prospect characteristics or activities that indicate improving fit for and interest in the product. We talked recently about the idea of customer success, and focusing on the types of prospects and customers who have a chance to succeed with your product. Lead scoring takes that a step further – it’s the framework for how to focus on those people and companies. Marketers who combine things they know about their prospects (demographic and firmographic info) with things they can see their prospects doing (behavioral info) automatically create a more sophisticated marketing and sales funnel. Imagine not only using marketing automation to trigger the next step of your marketing or sales process, but knowing your prospect is ready to hear the message at that next stage. It could be the difference between getting your message to land or losing out on a potential customer. Want to work through your own lead scoring model? Grab our free worksheet! So now that we understand its usefulness, let’s talk about creating your scoring model. It may seem a little unscientific at first, especially if you’re starting without a lot of data to back up your educated guesses about behavior, demographics, and scoring weights. But as you continue to define and refine your marketing and sales metrics, you’ll be able to adjust your lead scoring model to reflect (and predict!) which prospects matter most. The number one thing you need for lead scoring success? Marketing and sales teams who speak the same language oriented toward the same goals. Getting that kind of alignment should be a top priority for any organization. It creates more opportunities for leak-proof funnels, and when marketing can deliver the right kind of qualified leads and sales can close them, everyone wins. There’s two different kinds of scoring information you get from prospects: implicit and explicit. An effective program will have both, since both sets of data have a lot to tell you and complement each other. For instance, if you’re awarding points based on completing a lead magnet form or inferring a certain level of prospect sophistication based on years of experience, that’s implicit scoring. For instance, if your ideal audience persona is a chief marketing officer (CMO) from a company of 50-100 people in IT, and one of your prospects fills out a form and volunteers that they’re all three of those things, you would award points for each of them. That’s explicit scoring. This may seem like a no-brainer, but there’s so many answers to this question it can make your head spin. How can someone interact with us? And much more – anything your company does that’s outward-facing. What common factors do we see in our target customer persona and best customers? Since you’d like to qualify and move along prospects that seem likely to become your best customers, you can look at some of their defining characteristics and award points to those. “The State of Marketing Automation Maturity” report showed that most marketers use both, though more than a quarter do not. What does that action indicate about the prospect’s readiness for the next marketing or sales touch? Not everything someone can do related to your company means the same thing. They have six high-value things going for them – demonstrating a lot of interest and fit. Read a blog post in your resource section. Those are five pretty low-interest and low-fit indicators. Come up with a weighting system that awards “points” for each behavioral activity and demographic alignment. The points can be anything as long as they’re weighted in favor of the items that mean more interest and better fit. For instance, Marketo awards Critical behaviors 10 to 15 points, Important behaviors 5 to 9, and merely Influencing behavior 1 to 4 points. You need one scoring system for everything. Don’t score at the campaign level. Since you want your lead scoring to apply across all leads and all marketing and sales activities, maintaining a single scoring system makes sense. If you’re creating a new system for every campaign or activity, not only are you diluting your numbers, you’re wasting a lot of time creating scoring systems. For instance, if you create a scoring system for your spring marketing push where a 20 means “Go for it, Sales!” but a 20 over your winter marketing activities means “This one isn’t quite ready yet,” it’ll lead to a lot of confusion. Your leads’ scores should be changing constantly as they interact more with your marketing and sales assets. This means you should account for actions that show you a bad fit or lack of interest in the product. In the same vein, scores should be designed to degrade if no actions are taken. If your prospect isn’t interacting with your company, you need a signal that it’s time for a prospect recovery campaign of some kind, and their lead score should fall accordingly. For example, if they’re not visiting your website or stop engaging with your email marketing, their lead score should fall over time. Here’s where you’ll want to put that marketing automation hat aside for a minute and give your scoring model a critical human eye. A prospect may take actions that add up to a high lead score on the surface, but if you take a closer look, you’ll see it’s an illusion. Or, you might end up with a prospect who opens every single email you send…but does nothing else. If you’re awarding points with every email open, you’re probably giving that lead too much credit in the “interested in our product” department. Award points for a combination of actions. If a prospect opens an email, clicks, and then reads 50 percent of the article they land on, award points. Incorporate an element of lead grading. Instead of relying solely on your lead score, you can use your marketing insights to “grade” prospects. Someone with a high demographic score and low behavioral score might result in a prospect with a high overall lead score but very low intent-to-buy grade, for example. You can adjust your follow-up tactics accordingly. Talk to sales. Find out where your lead scoring system might be breaking down. Your sales team will know if highly-rated prospects keep getting referred with inflated scores. Feel like you’re ready to review or start your own lead scoring model? Our free worksheet can give you a hand with that! Lead scoring is not a “set it and forget it” activity – let’s be honest, nothing in marketing or sales is! You need to look at what’s happening in your funnel all the time to know if it’s working. If you’re sending people a drip campaign after they download their first lead magnet and hardly anyone is opening your emails, then maybe downloading a checklist isn’t as weighty a scoring indicator as you thought. Adjust all the time based on what the behavior and data tell you. And speaking of behavior, that’s one last lead-scoring related lesson: Lead scoring may help us to parse prospects’ behavior and apply a system to the marketing funnel, but always remember that you’re a human dealing with humans. The danger of reducing prospects to numbers is forgetting that they’re your potential customers, with pains and needs that you’re trying to help them solve. Not every insight you need for success can be found in data. Lead scoring should be a tool in your hands, not a crutch. Enjoyed this article? We create and promote high-quality content just like this on behalf of business founders on a consistent, done-for-you schedule. Schedule a free consultation to learn how we can help you with content marketing.